Home » If your neighbor’s tree falls on your home, who pays? The Issue: What If My Neighbor’s Tree Falls on My Home? Last night my neighbor’s tree fell on my deck causing thousands of dollars in damage to my home in Knoxville, TN. The neighbor’s insurance policy with Farmer Bureau didn’t cover the damage but my policy with ERIE Insurance did pay for it, less my deductible of $1,000. It doesn’t seem fair…Why did I have to pay? It wasn’t my fault? First, insurance companies deal with certain specific issues and limit their potential exposure in their policy. The insurance policy is very specific: unless your neighbor was doing something to his tree to cause it to come down, you can’t blame the neighbor. Answer: If your neighbor’s tree falls on your home, your own homeowner’s insurance policy should provide coverage for the loss. The location or ownership of the tree does not matter – your homeowner’s insurance policy should provide coverage either way. 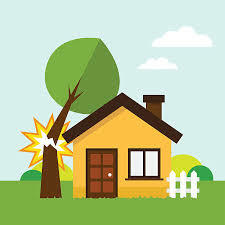 Here’s how the coverage works: If the tree is located on your property and falls on your neighbor’s home, his insurance company would have covered to make the repairs. Likewise, if the neighbor’s tree had fallen onto your home, then your insurance with ERIE Insurance would have covered the claim. What If A Tree Falls Down and Does Not Cause Damage, But Needs To Be Removed? In general, your Tennessee homeowner’s insurance policy does not cover the cost of removing trees that have fallen on your property. Your homeowner’s insurance only covers damage to your actual structure, and not any damage which may occur to or on your property. Therefore, if a tree falls on your property and does not cause any damage to your home or structure, you will be responsible for the cost of removing the fallen tree. What If your tree falls into the street? Many municipalities will cover the cost of removing the fallen tree from the roadway, but you will remain obligated to cover the cost of removing any remaining amount of the tree from your property.